The Candela Gentle LASE laser machine is one of the most effective and affordable systems you can buy for laser hair removal. With a 755 nm alexandrite laser and patient-friendly features like Candela’s exclusive Dynamic Cooling Device, this system can also tackle vascular lesions, pigmented lesions and skin rejuvenation. There is really no better value in cosmetic lasers than the Candela GentleLASE system. At SunrayLaser.com, we can save you up to 60% or more off the retail cost of new Candela GentleLASE laser equipment. Because this system can handle a wide variety of cosmetic applications, it is extremely cost effective to own and operate. The Candela GentleLASE offers an 18 mm spot size, which is larger than any other laser hair removal system. That means you can treat patients faster and more efficiently, which makes for return customers and a healthy bottom line. 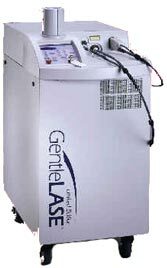 If you want to save money on the purchase of a pre-owned Candela GentleLASE laser machine, contact SunrayLaser.com today. With up to 17,666 watts of power, you will not find another system that is better at laser hair removal and you won’t find a lower price on a used Candela GentleLASE laser system anywhere else. We are always happy to provide a no obligation Candela GentleLASE price quote with no obligation, so fill out the contact form below and find out how much money we can help you save.